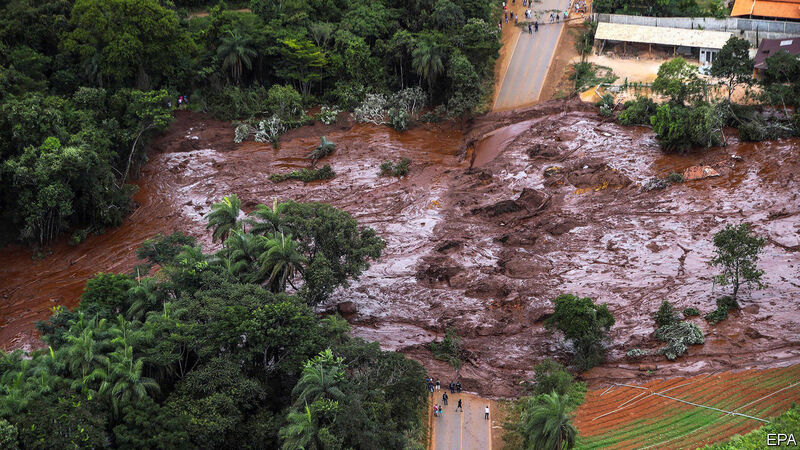 MORE THAN 300 people are missing, with many already confirmed dead, after millions of tons of muddy sludge engulfed homes and roads when a tailings dam at a mine in Brazil collapsed suddenly on January 25th. The dam near Brumadinho is owned by Vale, Brazil’s largest mining company. The cause of its bursting is being investigated, though it was inspected only four months ago and nothing appears to have indicated that it was about to fail. Over the years similar dams have given way at other mines around the world. One, jointly owned by Vale and BHP (an Anglo-Australian giant) near the town of Mariana in Brazil, collapsed in 2015, and potential penalties being discussed could exceed $40bn. There are about 3,500 tailings dams around the world. Unlike the dams used to build reservoirs or hydroelectric projects, tailings dams are not usually made from reinforced concrete or stone. They are mostly constructed from tailings, the waste material left over from mining operations. As lots of water and sometimes chemicals are used to extract the minerals and metals, the tailings largely consist of wet sludge. Depending on the type of mine, these tailings can be toxic. Miners used to dump them into rivers, but in recent decades, with environmental awareness growing, the sludge has come to be stored behind dams, where the solid material settles, allowing the water in the sludge to be recovered and reused. A tailings dam can be constructed by piling up rock and earth to produce an impermeable barrier, a reasonably stable method recommended in areas prone to earthquakes. But most tailings dams, such as the one that collapsed at Brumadinho, are built using the far cheaper “upstream” method. This involves banking up the tailings themselves, and then increasing the height of the dam as mining operations progress, by adding more material as the tailings dry out. Dams made with the upstream method are more likely to fail because the tailings are more sand-like and less dense than rocks and soil bought in from elsewhere. It means regular inspections and maintenance are required to ensure that the tailings in a dam do not become unstable or get eroded by water. This raises a particular concern when mines are shut down. Some engineers report that tailings dams at closed mines in a number of countries are in a perilous condition. The dam in Brumadinho was built in 1976 by a company that Vale acquired. It was last used for the disposal of tailings in 2015. Though the dam is no longer in service, Vale says it was inspecting and maintaining it in accordance with the world’s best mining practices. That means finding out exactly what caused the dam to collapse will be vital in determining if those international standards are strict enough.